A list of all the men from Sudbury who lost their lives during the First World War. Scroll down for the complete Roll, or use the links below. Roll of Honour completed by L.B.Cook in November 1919. Compiled by Shirley A. Smith. © Sudbury and District Royal British Legion, January 2007. Note: In the text the term 'CWGC' refers to the Commonwealth War Graves Commission. Stanley Ager was born in Sudbury in 1893, the eldest of four children of Herbert and Louisa Ager. His father was a journeyman butcher and the family lived at 14 Newman’s Road, Sudbury. At the age of 17 Stanley was employed as a ‘bottle washer’ for a local brewery. Joseph Allen was born in 1884 in Kings Lynn, Norfolk, the son of Harry and Cecelia Allen, of 5 Priory Walk, Sudbury. His father was a cocoa mat maker and most likely moved to Sudbury when his employers William Armes & Son moved their business to Sudbury from Kings Lynn. Harry Argent was born in Glemsford in 1893, the son of James and Martha Argent. In 1914 his widowed mother was living at 86 East Street, Sudbury. He had two brothers who also served on the front: Ernest served with the Royal Field Artillery and Walter with the East Lancashire Regiment. Frederick Barber, known as Fred was born in Ballingdon, Sudbury in 1894, one of seven children of Walter and Sarah Ann Barber. His father was a carman for a local miller, and the family lived at 6 Cross Street. By 1911 Frederick was employed as a clerk to an agricultural engineer. Albert Bareham was born in Sudbury in 1892, one of four children of Daniel Bareham and stepson of Sarah Bareham. In 1911 the family was living at 4 Ada Cottages, Stebbing near Dunmow, Essex where Albert and his father were employed as farm labourers. Bertie Bareham was born in Sudbury in 1889, the son of Henry Bertie and Emma Bareham. In 1891 he was living at 8 Girling Street with his widowed grandmother Sarah Bitten and mother Emma, who was employed as a silk weaver. By 1911 Bertie was boarding with the Filer family at 21 Newmans Road and was employed as a hawker’s assistant. Private Charles Alexander Baring, Australian Infantry A.I.F. Lance Corporal Ernest Baring, Australian Infantry A.I.F. Charles Barrell was born in Bulmer in 1886, one of twelve surviving children of George and Caroline Barrell. His father was a farm labourer and stockman and the family lived at Lower Houses, Bulmer. Before the war Charles was employed by Mr. Hyde Parker of Smeetham Hall in Bulmer as a farm labourer and was a member of the Territorial Army. Herbert Basham (recorded as ‘William Herbert’ on CWGC) was born in Sudbury in 1888, the youngest son of James and Mary Basham (née Blackshaw). His parents, two older sisters and an older brother were all employed as silk weavers and the family lived at 2 Plough Lane. Edward Bear was born in Sudbury on 11 April 1884, the son of William Lewis and Maria Bear. Both his parents were employed as silk weavers. The family lived at 18 Garden Row, before later moving to 7 Inkerman Row. Percy Beevis was born around 1890 in Romford, Essex, one of eight children of Albert and Emily Beevis. His father was a tailor and the family lived at 87 East Street, before moving to 17 Upper East Street. At the age of 21 Percy like his father was employed as a tailor. Albert Bell was born in Long Melford around 1890, the only surviving child of Samuel James and Alice Bell. His father was an innkeeper and at one time the family lived at the White Hart Inn in Long Melford before moving to the Green Dragon Hotel in Sudbury. Clarence Bell was born in Sudbury in 1893, the son of Ernest and Laura Bell. His father was an innkeeper at the Halfmoon Inn in Gregory Street. By 1911 his widowed mother was working as a domestic cook in Bures, she remarried in 1916 and moved to Ipswich. Edwin Belsham was born around 1891 in Tottenham, North London, one of six surviving children of Henry James (Harry) and Charlotte Belsham. His father was employed as a mechanical engineer and the family lived at one time in East Harnham, Wiltshire before moving to Priory Walk in Sudbury. His father was a Guardian for the Sudbury Workhouse. Sidney Binks was born in Sudbury around 1887, the youngest of five children of John and Maria Binks. His father was employed as a pig dealer and the family lived at 8 Straw Lane, before later moving to 16 Church Walk. Maurice Blythe (registered as Morris) was born in Sudbury in 1888, one of eight children of Joseph and Sarah Blythe. His father was a master butcher and Maurice like his older brother William followed his father into the trade as a butcher’s assistant. The family lived in Church Street, Sudbury. Harold Bond was born in Belchamp Walter in 1890, the second of three children of Samuel and Alice Bond. His father was a gardener and the family moved from Belchamp Walter to 52 Ballingdon Street in Sudbury. The family later moved to 15 Middleton Road. Arthur Botham was born in Sudbury in 1882, one of ten children of George and Caroline Botham. The family lived at one time in Cross Street and Gaol Lane. His widowed mother later moved to 16 Curds Lane (now Weavers Lane). Isaac William Braybrook, known as William was born in Sudbury around 1892, the son of William Henry and Maria Braybrook. The family lived at 8 Prince Street and his father was employed at one time as a cocoa mat maker and later as a brickmaker’s labourer. 43 Church Yard, Church Street before moving to 27 Station Road. His parents later moved to 11 East Street. Robert Bristow was born around 1885 in Saham Toney near Watton in Norfolk, the eldest son of Robert Edward and Deborah Bristow. His father was a miller and baker and the family lived in Ovington Road, Saham Toney. William Brown, known as Willie was born in Sudbury in 1890, one of eight children of Henry and Mary Ann Brown (née Harper). His father was employed as a maltster and the family lived at 32 Girling Street before moving to 15 East Street. William Percy Bunn, known as Willie was born around 1898 in Ballingdon, the son of Samuel and Emma Bunn. His father was a gardener and the family lived in Ballingdon Street. Willie enlisted in Sudbury and served with the Suffolk Regiment (formerly 3581). Leonard Byham was born in Sudbury around 1894, the eldest of two sons of Edward and Louisa Byham. The family lived at The Cottage, Wood Hall Farm where his father was a stockman. By 1911 the family had moved to Wood Hall View Cottages in Melford Road. Maurice Cardy was born in 1889 in Tottenham, London, one of eleven children of Maurice and Violet Jeanette Cardy. His father had been born in Sudbury but moved to London where he was a bricklayer. Robert Cardy was born in 1892 in Southwark, London, one of eleven children of Maurice and Violet Jeanette Cardy. His father was born in Sudbury but moved to London where he was employed as a bricklayer. By 1911 the family was living in Sudbury at 32 Mill Lane and his father was employed as a general labourer for Sudbury Borough Council. Private William Charles Carter, Australian Infantry A.I.F. William Carter, known as Charles was born in Sudbury in 1895. In 1911 Charles was living with his grandparents Charles and Mary Ann White at 18 Inkerman Row. His grandfather was a silk weaver and Charles was employed as an errand boy. See Herbert Basham as it has been confirmed by relatives and further research that Herbert Cattling is the same person as Herbert William Basham (235027) King’s Liverpool Regiment. George Chinery was born in 1895 in Acton near Sudbury, one of five children of George Frederick and Alice Chinery. His father was a mat weaver, his mother a horse-hair weaver and the family lived at Newman’s Green before moving to 2 Siam Terrace in Sudbury. See Clarence Cecil Francis as it has been confirmed by relatives and further research that this is the same person as Clarence Cecil Francis (203496) Bedfordshire Regiment. It is known that Clarence used his second name Cecil at one time. Arthur Clark was born in Sudbury in 1898, one of seven children of Henry (known as Harry) and Annie Clark. His father was employed as a soap maker and the family lived at 5 Straw Lane before moving to 22 Plough Lane. Arthur Clark was born in Sudbury in 1890. At the age of one he was living with his widowed mother Annie, a stay maker and Grandfather Thomas Clark, a groom and gardener at 19 Church Street. The family later moved to 63 Cross Street. His mother was Annie L Briggs who later lived at 88 Cross Street. Harry Clark was born in Sudbury around 1894, the eldest son and one of seven children of Henry (known as Harry) and Annie Clark. His father was employed as a soap maker and the family lived at 5 Straw Lane before moving to 22 Plough Lane. At the age of 17 Harry was employed as a butcher. Walter Clarke was born in 1878 in Washbrook, Suffolk, the son of David and Mary Ann Clarke. His father was a farm bailiff and the family moved around Suffolk due to his employment including Pond Hall in Bentley, Rams Farm in Hintlesham before moving to Chestnut Farm in Barham, Suffolk. Walter Cook was born in Hampshire near Odiham in 1885, one of nine known children of William March and Lucy Ann Cook. His father was an insurance agent and by 1901 the family had moved to Harsnett Road in Colchester before they moved to Sudbury to 9 Girton Terrace in Prince Street. John Coote was born in Sudbury around 1878, the son of David and Mary Coote. His father was a carpenter/builder and the family lived in Bulmer, Essex before they later moved to 28 Church Street in Sudbury. Arthur Crick was born in Sudbury in 1883, the son of Arthur and Emma Crick. The family lived at 65 Church Street; his father Arthur was a brickyard labourer and his mother was a charwoman. After his mother’s death his father remarried and the family moved to Station Cottage in Station Road where his father was employed on the railway. Ernest Cross was born in 1890 in Sudbury, one of nine children of William and Sarah Cross. His father was employed as a silk weaver, his mother as a tailoress and the family lived at 12 Garden Row. By 1911 his widowed mother had moved to 47 Mill Lane. George Cross was born in Sudbury in 1888, the son of William and Sarah Cross. His father was employed as a silk weaver, his mother as a tailoress and the family lived at 12 Garden Row. By 1911 his widowed mother had moved to 47 Mill Lane, Sudbury. Charles Crossley was born in Vauxhall, London in 1876, one of five children of Charles and Jane Crossley. By 1881 the family had moved to Sudbury where his father was employed as a manager of the silk power looms at one of the local silk factories. The family lived at 41 Station Road and later moved to 32 East Street. William Cutmore was born in 1880 in Glemsford, Suffolk, one of eight known children of Drewell and Elizabeth Cutmore. His father was a mat maker and his mother a silk weaver and the family lived at 14 Inkerman Row in Sudbury. Cyril Dale was born in Sudbury in 1897, the youngest of two sons of Arthur James and Elizabeth Emma Dale. His father was employed as ‘a shunter’ on the railway and the family lived at En Route Villas in Waldingfield Road before later moving to East Street. Frederick Daniels was born in Sudbury around 1890, one of ten surviving children of Harry and Achsah Daniels. His father was a gardener and general labourer and the family lived at 15 Burkitts Lane, before moving to 1 Garden Row. Harry Daniels was born around 1893 in Sudbury, one of ten surviving children of Harry and Achsah Daniels. His father was a gardener and general labourer and the family lived at 15 Burkitts Lane before moving to 1 Garden Row. William was born on 11 March 1890 in Bungay, Suffolk. He was the third son of Samuel and Jessie Davey. His father was employed as a hay cutter and the family lived in Nethergate Street, Bungay. William Deaves was born in Sudbury in early 1900, one of eight surviving children of Frederick Thomas and Louisa Deaves. His father was a carpenter and the family lived at 5 Harp Close Road. Herbert Debenham was born in Glemsford around 1900, the youngest of seven surviving children of Herbert and Eliza Debenham. His father was a cocoa mat maker and the family lived in Suffolk Road, Sudbury; at one time at Dairy Cottages before moving to 22 Queen’s Terrace. Robert Dixon was born on 22 August 1855 in Bocking, Essex, the son of William and Eliza Dixon. Robert married Ada Harvey in1884 in the Dunmow area and by 1891 they were living at 32 King Street in Sudbury. They had two children and later moved to Meadow Lane, before moving to 6 York Road. George Durrant was born in 1895 in Ballingdon, the eldest of three children of Philip and Sarah Durrant. His father was a brewery cellerman and drayman and the family lived at 44 Ballingdon Street, Sudbury. At the age of 15 George was employed as ‘a brewer’s bottler’. Alfred Edey was born in Sudbury around 1883, one of six surviving children of Alfred and Caroline Edey. His father was a foundry labourer and the family lived at 6 Burkitts Lane, before moving to 5 Church Walk and later to 65 East Street. William Edwards was born around 1874 in Ballingdon, Sudbury. At the age of 17 William was lodging at 10 Suffolk Square with Joseph Outing. He was employed as a labourer for a local brickmaker and married Mary Wade in 1900. They lived at 6 Suffolk Square. Henry Farrant, known as Harry was born in 1893 in Sudbury. He was the eldest of six known children of James and Sarah Farrant (née Bigmore). His father was a ‘foreman weaver’ for a hat trimming manufacturer and the family lived at 73 Cross Street before later moving to 22 Burkitts Lane. Bertie Felton was born in 1894 in Ballingdon, Sudbury, the second son of Frederick and Amelia Felton. His father was a ‘brewer’s cooper’ and the family lived at Robinson’s Yard in Ballingdon. Frederick Felton was born in 1891 in Sudbury, the eldest son of Frederick and Amelia Felton. His father was a ‘brewer’s cooper’ and the family lived at Robinson’s Yard in Ballingdon. Before enlisting Frederick was employed as a labourer at a local brickfield. Roland Ford was born in 1889 in Sudbury, the only son of George and Susannah Ford. His father was employed as a mat maker. Roland, his two sisters and their parents lived at 16 East Street before later moving to 3 Bridge Terrace, East Street. Private Lionel Foster, Australian Infantry A.I.F. Arthur French was born in Sudbury in 1888, the son of Walter and Lavinia French. His father was a labourer and the family lived at Mount Place, North Street before later moving to Gregory Street. See James Leonard – this is believed to be the same person as James Leonard (240390) who was living with his elder brother Thomas in 1911 with William and Emma French at 37 New Street in Sudbury (possibly adopted). John French was born in Hackney, London around 1871. He was the youngest son of George and Mary Ann French and the family lived in Groombridge Road, Hackney. His father was employed as a ‘Clerk to a foreign banker’ and by 1891 was ‘living on his own means’. Stanley Garwood was born in 1897 in Sudbury, the youngest of three sons of William and Mary Garwood. His father was a silk weaver and the family lived at 2 Oxford Terrace, Queens Road with his paternal grandparents. In 1911 Stanley was employed as an errand boy for a local stationer. Alfred Golding was born in Sudbury around 1884, the son of Sarah Golding. In 1901 the family lived in Upper East Street and Alfred was employed as a house painter. Arthur Golding was born in 1878 in Belchamp St. Paul, the eldest of six sons of Solomon and Emily Golding. His father was a farm labourer and the family lived at Mashey Road, Belchamp St. Paul in Essex. Frederick Goodfellow was born in 1892 in Westminster, London. The son of James and Eliza Goodfellow. He married Mary Ann Risby in 1913 in Holborn, London and was living in St. Pancras when he enlisted and served with the Royal Welsh Fusiliers (formerly 27825) before transferring to the Welsh Regiment. Harry (Henry) Goodwin was born in 1884 in Sudbury, he was one of three children of James and Maria Goodwin. His father was employed as a brickmaker and general labourer and the family lived at 73 Melford Road before later moving to number 80. Sidney Griggs was born in Sudbury in 1898, one of six surviving children of Walter and Emma Maria Griggs. His father was employed as a warehouse porter, his mother a silk winder and the family lived at 11 Church Row, before moving to 70 East Street. Cyril Grimwood was born in 1899 in West Ham, East London. By 1911 he was living in Sudbury with his father’s sister and husband; Henry and Harriet Jarmin (née Grimwood) and their son William in Upper East Street. John Grimwood was born in Hitcham in 1886, the son of John and Louisa Grimwood. His father was a bricklayer and the family lived at Church Street, Monks Eleigh. By 1911 the family had moved to Sudbury and lived at one time at 37 Friar Street and also Park Lodge, Gallows Hill. Robert Hammond was born in Bermondsey, London in 1884. He was the only son of Robert James and Mary Hammond (née Okey). His father was employed as a docks foreman. Robert had three sisters: Florence Joanne, Lydia Caroline and Maud Annie. Ernest Harrison was born in Sudbury around 1881, one of nine surviving children of George James and Ellen Harrison. His father was a groom/gardener and the family lived at 11 Newton Road, before moving to Cross Street. Francis Edwin Harrison (Frank) was born in Sudbury in 1888, one of nine surviving children of George James and Ellen Harrison. His father was a groom/gardener and the family lived at 11 Newton Road, before moving to Cross Street. It is believed that Frederick was related to Ernest and Frank Harrison (See the Sudbury Roll of Honour) as the death of a ‘Frederick’ is mentioned in a letter from their mother to Ernest but I have been unable to confirm the full identity of Frederick at the present time. Frederick Harrison is remembered on the Sudbury War Memorial. Percival Hollingsworth (known as Percy) was born in Great Cornard in 1889, one of eleven surviving children of William Charles and Laura Hollingsworth. His father was a railway carpenter and the family lived at Ormond Terrace, Sudbury Road, Great Cornard. George Charles Holt, known as Charles was born around 1888 in Yardley. He had an older brother Edward and an older sister Gertrude. He married Maud Alice Seeley in St Stephen’s Church, Hammersmith on 29 April 1915 and was employed as a carriage cleaner on the railways. Frank Hopes was born in 1896 in Raydon, Suffolk, the eldest son of Robert and Jessie Hopes. Frank like his father was a woodman and the family lived at The Woodlands in Raydon. Leonard Hostler was born in 1889 in Sudbury, the son of Charles James and Albinia Mary Hostler. His father was employed as a maltster. He had two older brothers; James and Charlie and the family lived at 24 Burkitts Lane before later moving to 7 Girton Terrace, Prince Street. Percy Hume was born in Ballingdon in 1894, the eldest of seven known children of John and Alice Hume. His father was a lime burner and the family lived at 42 Ballingdon Street. At the age of 16 Percy was employed at a local matting factory. 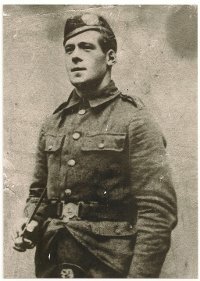 Fergus Hurst enlisted in Sudbury. He died on 16th June 1917. There is no known grave and he is remembered on the Arras Memorial, Pas de Calais, France. Arthur Jarmyn was born around 1888 in Glemsford, the son of Amos and Emma Jarmyn. His father was a cocoa mat maker and the family lived at Bells Lane before moving to 17 Garden Row in Sudbury. Private Wilfred Argent Jennings, Australian Infantry A.I.F. Private Robert Sizer Joy, Australian Infantry A.I.F. Arthur Jukes was born in 1871 in Clapham, London, the son of Rev. Richard Starr Jukes and Mary Jukes. His father was at one time the Rector of Milton Church in Gravesend and Arthur attended St John’s School Leatherhead as a boarder. Walter Kemp was the only son of Walter and Hannah Kemp, born in Sudbury in May 1892. Prior to enlisting he was employed as a painter’s labourer and lived with his widowed mother and three sisters Florence, Ethel and Eva at 24 Station Road. Harry King was born in Ballingdon, Sudbury around 1888 and was the second son and one of six children of Edward and Eliza Victoria King. His father was an assistant brewer and the family lived at 68 Ballingdon Street. James Leonard was born in Wolverhampton in 1896, the youngest of three known children of Thomas and Mary Jane Leonard. By 1901 his widowed mother was employed as a brush maker and the family was living in Collier Street, Wolverhampton. Private Gerald Letchford, Canterbury Regiment N.Z.E.F. 6/2185 2nd Battalion, Canterbury Regiment, New Zealand Expeditionary Force. Bertie Lorking was born in Sudbury around 1894, one of seven children of William and Emma Lorking. His father was a plasterer and the family lived at 25 Burkitts Lane before later moving to Newmans Road. At the age of 17 Bertie was employed as cycle repairer. Harry Lorkings was born around 1890 in Glemsford, one of seven surviving children of John and Adelaide Lorkings. His father was a Coconut mat maker and the family lived at one time in Cross Street and at number 22 and 24 Church Street. Percy Lumley was born in Sudbury around 1893, the son of Alfred and Sarah Lumley. His father was a bricklayer and the family lived at 94 East Street. Bert Malyon was born in Cavendish around 1888, the son of George and Jane Malyon and his father was employed as a maltster. Like many Suffolk agricultural labourers the family moved between Suffolk and Burton-on-Trent during the year for work. Harry Malyon was born in Burton-on-Trent, Staffordshire around 1877. He was the son of George and Jane Malyon and his father was employed as a maltster. Like many Suffolk agricultural labourers the family moved between Suffolk and Burton-on-Trent during the year for work. Arthur Martin was born in Ballingdon around 1877, the son of Adam and Mary Ann Martin. His father was employed as a brickyard labourer and his mother a horsehair weaver. Bertie Martin was born in Sudbury in 1886 it is believed one of nine children of Herbert and Maria Martin. His father was a stoker at the local gas works and the family lived in Elliston’s Yard, Ballingdon. Charles Mathew was born in 1887 in Sudbury, one of eleven children of James and Harriet Mathew. His father was a farm labourer and the family lived at 22 Middleton Road, Ballingdon before moving to Red Cottages in Foxearth. Bernard Mattingly was born on 21 April 1886 in Great Cornard. He was the son of Robert and Gertrude Emma Mattingly. His father was a Justice of the Peace and Mayor of Sudbury five times between 1883 and 1905. Percy Mayes was born in 1890 in Sudbury, the eldest son and one of seven children of Henry and Emma Mayes. His father was an agricultural labourer and the family lived at 25 Cross Street, before moving to Elliston’s Yard, Ballingdon. By 1911 Percy had moved to Billericay and was employed as a baker’s assistant. Frank Mixer was born in1893 in Sudbury, one of seven surviving children of George and Emily Mixer. His father was employed as an ironmoulder and the family lived in Newmans Road. By 1911 his widowed mother had moved to Acton Lane and Frank was living in Cavendish Buildings, Clerkenwell Road in London employed as a lift attendant. Arthur Robert Moore known as Robert was born around 1895 in Stoke by Nayland and was the eldest son of eight children of Arthur John and Frederica Emma Moore. His father was a house decorator and the family of eleven lived at 40 Ballingdon Street, Sudbury. At the age of 15 Robert was employed as an errand boy. Ernest Morgan was born in Malta, (recorded as ‘Edward’ on the original Roll of Honour and medal card). He enlisted in Sudbury and served with the Suffolk Regiment (formerly 3090). It is not known when he joined his battalion. James Mumford was born in Sudbury around 1886. By 1911 he was boarding with the Boggis family at 3 Clarence Road and was employed as a mat maker but he had moved to Tottenham Court Road in London by the time he enlisted in Camden Town. Albert Newman was born in Sudbury in 1898, the eldest of four surviving children of Harry and Susannah Newman. His father was an agricultural labourer and his mother was a yarn puller at a local silk mill. The family lived at 28 Mill Lane and later moved to 2 Byford’s Yard in Cross Street. Maurice Norman was born in Ballingdon around 1880, one of eight surviving children of Robert and Emily Norman. His father was a bargeman and the family lived at Lock House in Nayland before moving to 8 Middleton Road, Ballingdon. 7th Battalion, Queen’s Own (Royal West Kent Regiment) . There was no set criteria for names to be put forward for the Sudbury War Memorial in 1919 and his name may have been put forward by different friends or relatives hence he is on the War Memorial under both names. Robert Nunn was born in Sudbury around 1896 and was the only child of Harry and Rose Nunn. His father was a mat finisher and the family lived at 11 School Street. At the age of 15 Robert was employed as a labourer for a market gardener. Sidney Nunn was born in Sudbury in 1899, the eldest son of four children of Walter and Mary Nunn. His father was a butcher with a shop in North Street and the family lived in Suffolk Road. Stanley Nunn was born in Braintree around 1893, the youngest of five surviving children of James and Caroline Nunn of Stour View, Cornard Road, Sudbury. His father was the manager of ‘a power loom silk weaving department’. At the age of 17 Stanley was also employed in silk weaving as a ‘tackler’. George Parker was born in Sudbury around 1883 and was the son of David and Sarah Parker (née Barrell). His father was ‘a horsekeeper’ and the family lived at 23 Mill Lane together with his mother’s sister Mary Barrell. Percy Partridge was born in Bulmer, Essex around 1894 and was one of seven surviving children of Alfred John and Eliza Partridge. His father was employed as a horseman, his mother was a silk weaver and the family lived at No. 41 Ballingdon Street in Sudbury. Walter Patrick was born in 1897 in Hundon, Suffolk and was the only son of William and Henrietta Patrick. His father was a tailor and his mother a dressmaker. John Pettit was born on 12 June 1900 in Braintree, Essex, one of three children of Horace Henry and Emily Ethel Pettitt. His father was a highway surveyor and in 1901 the family was living in Braintree. By 1911 the family had moved to Wash Farm, Hundon before they later moved to “Le Chalet”, Priory Road in Sudbury. Leonard Poole was born in Haverhill around 1900, the son of Joseph and Alice Poole. The family lived at Burton End and Bumpstead Road, Haverhill before moving to 4 Plough Lane in Sudbury. Leonard’s parents were both employed as silk weavers. Bertie Potter was born in Ballingdon around 1888, the son of Jacob and Hannah Potter. The family lived at 92 Ballingdon Street and his father was employed as a shoemaker and his mother was a tailoress. By 1901 his widowed mother had moved to 29 Cross Street. Percy Ratcliffe was born in Ballingdon, Sudbury around 1896, one of six surviving children of Henry (Harry) and Eliza Ratcliffe. His father was a bootmaker and the family lived at 63 Ballingdon Street. At the age of 15 Percy was employed as a Post Messenger. Thomas Reeder was born in 1886 in Beccles, Suffolk, one of six children of James and Lucy Reeder. His father was a maltster’s labourer and the family lived in Beccles. George Sage was born around 1893 in Burton-on-Trent, Staffordshire, one of four children of Frederick and Ellen Sophia Sage. His father was a hairdresser and the family lived in Clare before moving to 53 Station Road in Sudbury. Percy Sillett was born around 1896 in Harleston in Norfolk, one of eleven children of James Frederick and Eliza Sillett. The family moved to Sudbury where his father was employed as ‘an engine driver’ in a local brewery and the family lived at 5 Girling Street before later moving to 23 Plough Lane. Henry Archibald Sillitoe, known as Harry was born in 1876 in Sudbury, one of seven children of Frederick and Mary Ann Eliza (Lizzie) Sillitoe. His father was a confectioner and the family lived above the business on Market Hill, Sudbury. Arthur Smith was born in Sudbury around 1892, one of five children of Arthur Harry and Emily Jane Smith. His father was a bootmaker and the family lived at 10 Market Hill. After his father’s death in 1904 the family moved to 16 Newmans Road. Ernest Smith was born in 1876 in Sudbury, one of six surviving children of John and Emma Smith. Both his parents were employed as silk weavers and the family lived in Gregory Gardens before moving to 21 Station Road. Gilbert Smith was born in Sudbury around 1894, one of five children of Arthur Harry and Emily Jane Smith. His father was a bootmaker and the family lived at 10 Market Hill. After his father’s death in 1904 the family moved to 16 Newmans Road. At the age of 17 Gilbert was employed as a printer’s apprentice. Richard Smith was born in Sudbury around 1893, one of six children of Thomas and Harriet Smith. His father was a coca mat maker and general labourer. The family lived at 35 Mill Lane and later moved to No. 46. Richard was employed as a groom and was living in Halstead when he enlisted to serve with the Essex Regiment. Robert Smylie was born on 7 April 1874. His father died when he was a child. He attended Ballymeena Grammar School and later graduated from London University taking his M.A. in 1903. He came to Sudbury from the King Edward VI Grammar School in Chelmsford where he was a Lieutenant with the Cadet Corps. Ernest Sore was born in Westgate Street, Long Melford on 21 March 1882. The son of Arthur George and Eliza Sore (née Sergeant). His father was employed as a brewer’s labourer and the family lived in Broom Street in Great Cornard, before they later moved to 82 East Street in Sudbury. Ernest had six brothers and three sisters. John Spreckley was born 12 April 1895 in Islington, London, the only child of John and Caroline Spreckley. His father was an accountant and the family later moved to Bedford. John attended Sudbury Grammar School; by the age of 15 he had left to attend the School of Engineering in London. John Stearns was born around 1889 in Acton, Suffolk, one of three surviving children of William and Sarah Stearns. His father was a farm labourer and the family lived at Post Office Row, Sudbury Road, Acton, before moving to 53 East Street in Sudbury. Before enlisting John was employed as a shop porter. Ambrose Suttle was born in 1892 in Glemsford, the son of John and Ellen May Ambrose (née Copsey). His father was employed as a cocoa matting weaver and the family lived in Egremont Street, Glemsford where his mother worked from home as a ‘hair brush weaver’. Ernest Tatum was born in Cockfield around 1891, one of six children of Arthur and Elizabeth Tatum. His father was employed as an agricultural labourer; his mother a horsehair weaver. The family moved to Hebbs Green in Lawshall before moving to 51 East Street, Sudbury. Albert Tuffen was born in 1893 in Sudbury, one of six surviving children of William and Annie Tuffen (née Ruggles). His father had various jobs ranging from gardener, a lime burner and later a carman for a local coal yard and the family lived in Church Row before moving to 10 Gooseberry Row (where North Street car park is today). Arthur Turner was born in 1882 in Sudbury, one of five children of William and Susan Turner. His father was employed as a foreman in a local mat factory. In 1901 the family was living at St. Mary’s Street West in Long Melford and employed a servant. They later moved to Rectory Cottages in Liston. Leonard Watson was born in Sudbury around 1890, the third son of Abraham John and Mary Ann Watson (née French). In 1901 the family was living at 32 Sepulchre Street, (now Gainsborough Street). His brother Edward was an assistant schoolmaster and his sister Florence was an assistant schoolmistress. Frederick Watton, known as Fred was born in Sudbury around 1893, the eldest of six surviving children of William George and Susannah Watton (née Beer). His father was a mechanic at a local silk factory and the family lived at 4 Oxford Terrace, Queens Road. At the age of 17 Fred was employed as a carpenter’s apprentice. Bertie Webb was born in Sudbury around 1891. He was the son of Henry and Rebecca Webb. His father was a general labourer. In 1901 the family of 7 were living at 43 Ballingdon Street. Bertie was living in Sudbury when he enlisted, formerly as 199445 Army Service Corps. Leonard Webb was born in Beccles in 1893, the second eldest of six sons of William and Edith Webb. The family lived at The Old Brewery House, Bridge Street in Beccles where his father was employed as a maltster’s labourer, they later moved to Stowmarket where Leonard went to school. Wallace Webb was born in Beccles in1898, the fourth of six sons of William and Edith Webb. The family lived at The Old Brewery House, Bridge Street in Beccles where his father was employed as a maltster’s labourer, they later moved to Stowmarket before moving to 3 Bank buildings, Sudbury. William Webb was born in Sudbury around 1889, one of eight surviving children of William and Eliza Webb. His father had died by 1891 and the family was living in Byfords Yard. By 1901 his widowed mother was employed as a yarn spinner in a local matting factory and the family had moved to Laundry Gardens. Peter Welsh was born around 1887 in Howick, Ayrshire, Scotland. By 1911 he was a regular soldier serving with 1st Battalion, Northumberland Fusiliers at West Ridge, Rawalpindi in India. Charles White was born around 1899 in Soho, London, the youngest of two sons of William and Harriet White. By 1901 the family had moved to Sudbury, his father was a retired police constable and the family lived at York Villas in Clarence Road. A medical record has been found for ‘Fred Charles White 45120’ but it has not been confirmed at the present time if it is the correct record for the above man. Sidney White was born in Ballingdon in 1893, the son of William and Ellen White. His father was a blacksmith and the family lived at 67 Ballingdon Street. Unable to trace the correct record for J. Willis. 17th Battalion, King’s Royal Rifle Corps. Percy Charles Wright enlisted at Woolwich and the 3rd (Reserve) Battalion, Gloucester Regiment was based at Woolwich in 1915. Percy very likely transferred to the King’s Royal Rifle Corps for overseas service. John Yearsley was born 1888 in Chester, Cheshire, the son of John L Yearsley. His father was a travelling drapery salesman and he later lived in Spout Lane, Little Cornard.